“As one of the first resources to address the psychosocial challenges of TCKs this is a groundbreaking book. Named one of the TOP FIVE new books in 2014 by Global Living Magazine. Featured in American Counseling Association Magazine. 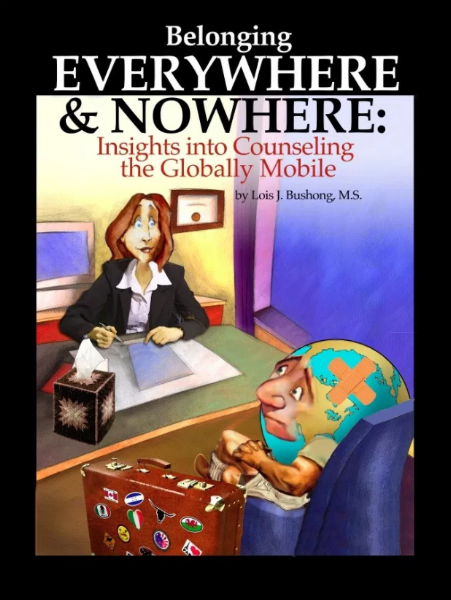 Bushong, a licensed marriage and family therapist, delves into this previously, unexplored world of how to effectively counsel clients raised outside of their parents' home culture. Readers will discover the basic characteristics and counseling skills effective with Third Culture Kids (those who have spent the majority of their developmental years outside of their passport country). Because of the rapid growth of the expat community, counselors must look at the uniqueness of working with children who grow up as a Third Culture Kid, the common presenting issues for adults TCKs and what often lies hidden beneath the surface. The book is filled with practical examples, interesting stories, tips, charts, resources, theories, techniques and discussion questions for further study. Who Third Culture Kids (TCK), Global Nomads, Cross-Cultural Kids, Missionary Kids, Military Brats are - and how they are alike but different. Review possible diagnoses for TCKs. How to work with TCKs on issues of identity, unresolved grief, hidden losses and rootlessness. Various types of treatment, sample forms, resources, techniques and theories which seem to work best with this population. — Donna Mischell Navarro, Ph.D, Psychologist, United States Air Force, Washington D.C.